In a skillet on the stovetop, heat olive oil and add onions and garlic. Sauté for approximately 8–10 minutes until onions are soft. In a large pot on the stovetop, pour in tomatoes. Add in basil, the cooked onions and garlic, cheeses, Italian seasonings, brown sugar, and red wine. Stir. Add in garlic salt and pepper to taste. Cook uncovered, stirring occasionally, over low heat for 20 minutes. Whatever sauce you don’t use can be stored away in the frig for another meal and/or place in a tupperware dish and freeze. This Marinara Sauce can simmer for 20 minutes before you add to the pizza. If you have more time, you can also simmer the sauce for 45-50 minutes to give the ingredients more time to marinate. Either way, you’ll enjoy it! 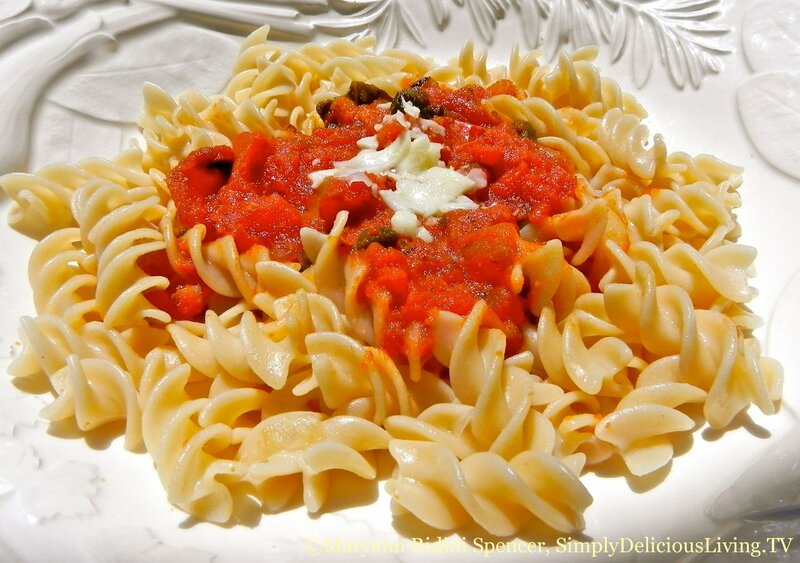 This Marinara Sauce can be made a day or so in advance of serving. You can also make it, freeze it, and later defrost and use it. When you make this recipe to use in the Flatbread Pizza recipe, you will have left over sauce that you can use on pasta or perhaps mix with fresh vegetables like zucchini, peppers and onion to make some ratatouille.